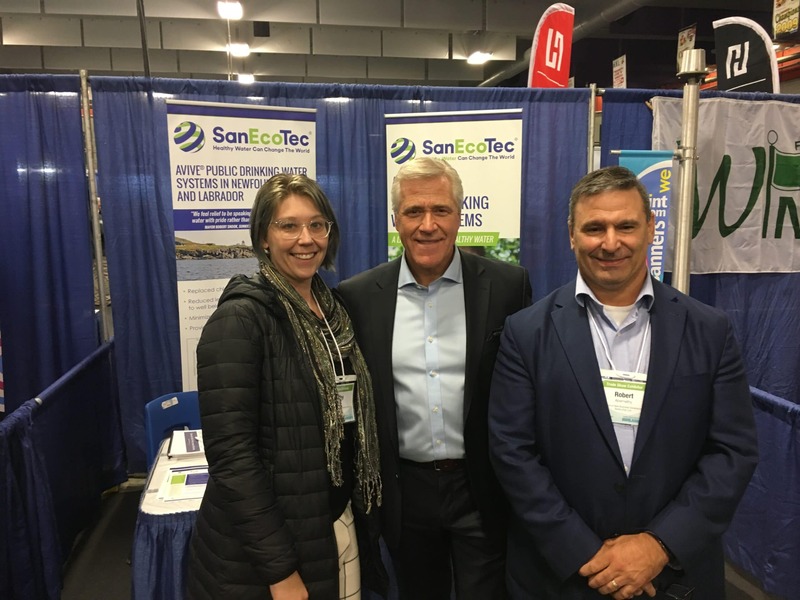 On October 4-6, Robert Abernethy, Director of New Business Development, and Ashley Hillier, Water Quality Coordinator, at SanEcoTec® Ltd. attended the 68th annual Municipalities Newfoundland and Labrador Conference & Trade Show in Gander, Newfoundland. Robert and Ashley represented the AVIVE® Public Drinking Water System created by SanEcoTec. AVIVE is approved for secondary disinfection in water treatment by the provincial government of Newfoundland and Labrador. An AVIVE system has been operating in Sunnyside, Newfoundland, since 2014 while a short-term project occurred in Milltown, Newfoundland, in late 2017 until early 2018. Over the course of the show, Robert and Ashley engaged with many municipal leaders, Town Councillors and other community representatives. Robert and Ashley also had the opportunity to speak with the Premier of Newfoundland and Labrador, Dwight Ball, about the impacts AVIVE has had in Newfoundland. Shortly after its installation in Sunnyside, AVIVE reduced levels of THMs and HAAs to well below Health Canada guidelines. THMs and HAAs are two groups of harmful disinfection by-products created when chlorine – the conventional water disinfectant in Newfoundland – comes into contact with organics. SanEcoTec looks forward to continuing its work in Newfoundland by providing healthy, delicious water for residents while supporting the long-term needs of public health and the environment.